We love our travels, we love our cake - sometimes it just has to be made! Try this easy recipe to satisfy your craving. In a bowl, cream together unsalted butter and caster sugar until fluffy. Gradually add beaten eggs, beating well each time. Sift in self-raising flour and fold in until smooth, then stir in the finely grated orange and lemon zest, add the handful of mint. Stir in 50mls of Pimms, then pour the mixture into a greased and lined 450g loaf tin. Bake for around 40 to 50 minutes. 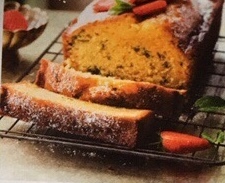 Meanwhile, stir the orange and lemon juice into 100mls Pimm's Take the cake out of the oven and prick the top with a skewer, then pour over the Pimm's mixture over the cake and leave to cool. Pimms isn’t just for drinking!